Health • Hoof Care • Nutrition • Our ProgressOver-Reach Boots, Kevin Bacons, Biotin and Copper Nails. Some of you may remember that last winter Scottie developed a new habit out of the blue, regularly removing his shoes! There were several factors for this, one being that he was starting to really use his hind end properly and was over tracking and over reaching, leading to him standing on his shoes and pulling him off. However, other factors I think included horrible, sucky, mud and something lacking from his diet. So this year, I’m hoping things will be different. (Although we are still having a few issues with shoe loss.) We come in for winter on the 1st of October and I have recently made a few changes to our routine and management to hopefully break this habit for good! Currently I pick out his feet at least every other day, if not every day. Some days I’ll just check them and if they are fairly clear and he’s not coming out the field I will just leave the little mud what’s there, there. However, once he is in every day he will have them done every day, if not twice a day. (That’s our usual winter routine.) I am also hoping to get into the routine of using our Kevin Bacons Hoof Dressing at least a few times a week, rather than our whenever I remember to routine we have at the moment. And not to forget iodine spray, to be used whenever feet are getting a bit smelly, which hopefully won’t be too often! This is a fairly new thing to our routine after several nutritionists said that Scottie was lacking slightly and recommended a biotin supplement of some sort. Although it is too early to say whether this will help us keep shoes on, I think I am seeing an improvement in hoof growth. In the photo below you can see that there is thicker hoof growth at the top. I have been feeding biotin about 2 months, maybe a bit less, and I would say that that is about 2 months’ worth of hoof growth. So hopefully this means that we are growing stronger, healthier hoof, not just more of it! After starting my new job and spending a lot of time marketing these new copper nails, I had to ask my farrier to get some for us! Case studies I have seen have seen good improvements of the quality of the hoof wall and less bacterial infections since using cooper nails, so I definitely thought it was worth a try. Even though the official experiment hasn’t finished yet to say how much the nails actually do. 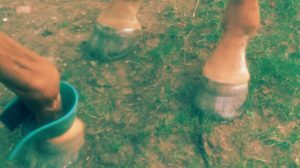 What is your winter hoof care routine?